of the Inner Temple and of Oxshott Surrey. Born 1854. Died 1925.
Who desired to be buried near a Yorkshire moor. 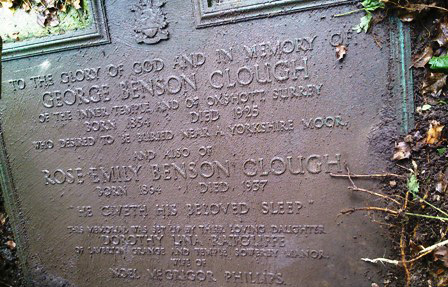 And also of Rose Emily Benson Clough. Born 1864. Died 1937. “He giveth his beloved sleep”. of Laverton Grange and Temple Sowerby Manor wife of Noel McGrigor Phillips.